Domino's won't stop until its customers are able to simply think about Domino's pizza and suddenly find themselves magically munching on it. The pizza chain isn't quite there yet. But today it's taking another step toward making its customer interactions friction-free by introducing a "Zero Click" ordering app. It works like this: You download the app and link it to a Domino's pizza profile, where you have a standard "Easy Order" saved. When you open the app, it automatically orders your pizza, with no clicks required. You have a 10-second countdown window, in case you mistakenly opened the app, to avert the order. 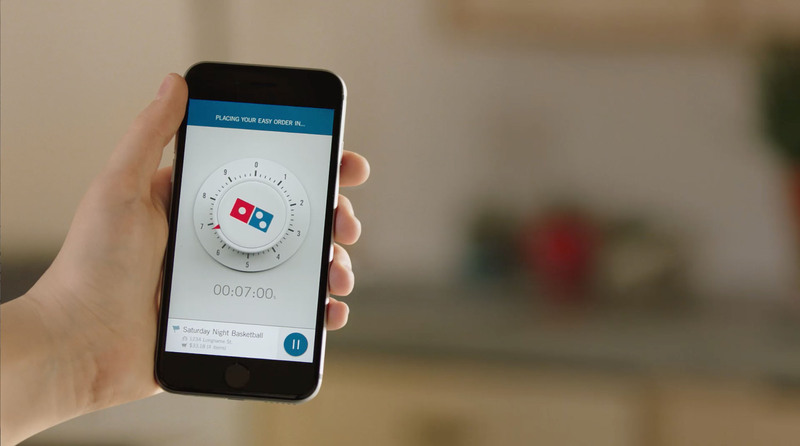 The app, from Crispin Porter + Bogusky, follows other Domino's innovations like voice, smart watch, car, TV and tweet and text ordering with an emoji. Even the quote in the "Zero Click" press release is on the goofy side—suggesting Domino's is having fun, with a wink, as much as it's actually trying to improve your life. "We think about how to make digital ordering better all day and all night," Dennis Maloney, chief digital officer at Domino's, says in the release. "Zero-click ordering is a dream come true for us. I'm not saying the idea came to me in a dream (and I'm not saying it didn't), but I challenge someone to dream up an easier way to order." Still, if Domino's is not just selling convenience, by also playing an elaborate PR game around the idea of convenience, it does have the overall effect of making the brand look fun, socially engaged and forward-thinking.